In the past few years we have seen great advancements in the area of ultra compact cordless tools. Now, Dewalt is trying their hand, and pushing the market in the direction of compact routers with features you would only expect in a full size router. 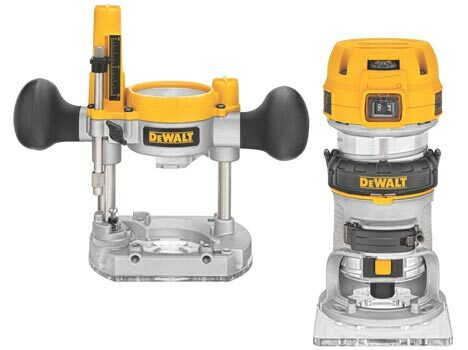 So what sets the new DeWalt routers apart from compact (trim) routers of the past? Well, just about everything. Dewalt has taken all the features you would want in a router, sized them down, and put them in a more compact body. The 1-1/4 peak HP motor offers more power then the other trim routers on the market today, allowing users to do more load intensive tasks. It is not up to full-sized router par, but we wouldn't expect it to be. A variable speed control also puts it in a class with the big boys, as most routers in its class only offer a single speed. A variable speed control lets you customize your speed to fit the type of bit you are using and the type of material you are cutting. Other features that should make your routing experience even better include: dual LED lights that provide illumination for your work surface, an extended 1/4-inch router collet that provides greater holding strength and less vibration. My favorite feature has to be the 12-point spindle lock, that eliminates the need for using two wrenches for changing or adjusting bits.